This article is about an isotope of plutonium. For the film also known as The Half Life of Timofey Berezin, see Pu-239 (film). Plutonium-239 is an isotope of plutonium. Plutonium-239 is the primary fissile isotope used for the production of nuclear weapons, although uranium-235 has also been used. Plutonium-239 is also one of the three main isotopes demonstrated usable as fuel in thermal spectrum nuclear reactors, along with uranium-235 and uranium-233. Plutonium-239 has a half-life of 24,110 years. The nuclear properties of plutonium-239, as well as the ability to produce large amounts of nearly pure Pu-239 more cheaply than highly enriched weapons-grade uranium-235, led to its use in nuclear weapons and nuclear power plants. The fissioning of an atom of uranium-235 in the reactor of a nuclear power plant produces two to three neutrons, and these neutrons can be absorbed by uranium-238 to produce plutonium-239 and other isotopes. Plutonium-239 can also absorb neutrons and fission along with the uranium-235 in a reactor. Of all the common nuclear fuels, Pu-239 has the smallest critical mass. A spherical untamped critical mass is about 11 kg (24.2 lbs), 10.2 cm (4") in diameter. Using appropriate triggers, neutron reflectors, implosion geometry and tampers, this critical mass can be reduced by more than twofold. This optimization usually requires a large nuclear development organization supported by a sovereign nation. The fission of one atom of Pu-239 generates 207.1 MeV = 3.318 × 10-11 J, i.e. 19.98 TJ/mol = 83.61 TJ/kg, or about 23,222,915 kilowatt hours/kg. Fission activity is relatively rare, so even after significant exposure, the Pu-239 is still mixed with a great deal of U-238 (and possibly other isotopes of uranium), oxygen, other components of the original material, and fission products. Only if the fuel has been exposed for a few days in the reactor, can the Pu-239 be chemically separated from the rest of the material to yield high-purity Pu-239 metal. Pu-239 has a higher probability for fission than U-235 and a larger number of neutrons produced per fission event, so it has a smaller critical mass. Pure Pu-239 also has a reasonably low rate of neutron emission due to spontaneous fission (10 fission/s-kg), making it feasible to assemble a mass that is highly supercritical before a detonation chain reaction begins. In practice, however, reactor-bred plutonium will invariably contain a certain amount of Pu-240 due to the tendency of Pu-239 to absorb an additional neutron during production. Pu-240 has a high rate of spontaneous fission events (415,000 fission/s-kg), making it an undesirable contaminant. 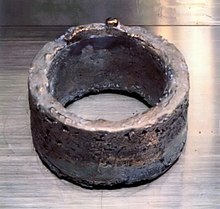 As a result, plutonium containing a significant fraction of Pu-240 is not well-suited to use in nuclear weapons; it emits neutron radiation, making handling more difficult, and its presence can lead to a "fizzle" in which a small explosion occurs, destroying the weapon but not causing fission of a significant fraction of the fuel. (However, in modern nuclear weapons using neutron generators for initiation and fusion boosting to supply extra neutrons, fizzling is not an issue.) It is because of this limitation that plutonium-based weapons must be implosion-type, rather than gun-type. Moreover, Pu-239 and Pu-240 cannot be chemically distinguished, so expensive and difficult isotope separation would be necessary to separate them. Weapons-grade plutonium is defined as containing no more than 7% Pu-240; this is achieved by only exposing U-238 to neutron sources for short periods of time to minimize the Pu-240 produced. A nuclear reactor that is used to produce plutonium for weapons therefore generally has a means for exposing U-238 to neutron radiation and for frequently replacing the irradiated U-238 with new U-238. A reactor running on unenriched or moderately enriched uranium contains a great deal of U-238. However, most commercial nuclear power reactor designs require the entire reactor to shut down, often for weeks, in order to change the fuel elements. They therefore produce plutonium in a mix of isotopes that is not well-suited to weapon construction. Such a reactor could have machinery added that would permit U-238 slugs to be placed near the core and changed frequently, or it could be shut down frequently, so proliferation is a concern; for this reason, the International Atomic Energy Agency inspects licensed reactors often. A few commercial power reactor designs, such as the reaktor bolshoy moshchnosti kanalniy (RBMK) and pressurized heavy water reactor (PHWR), do permit refueling without shutdowns, and they may pose a proliferation risk. (In fact, the RBMK was built by the Soviet Union during the Cold War, so despite their ostensibly peaceful purpose, it is likely that plutonium production was a design criterion.) By contrast, the Canadian CANDU heavy-water moderated natural-uranium fueled reactor can also be refueled while operating, but it normally consumes most of the Pu-239 it produces in situ; thus, it is not only inherently less proliferative than most reactors, but can even be operated as an "actinide incinerator." The American IFR (Integral Fast Reactor) can also be operated in an "incineration mode," having some advantages in not building up the Pu-242 isotope or the long-lived actinides, either of which cannot be easily burned except in a fast reactor. Also IFR fuel has a high proportion of burnable isotopes, while in CANDU an inert material is needed to dilute the fuel; this means the IFR can burn a higher fraction of its fuel before needing reprocessing. Most plutonium is produced in research reactors or plutonium production reactors called breeder reactors because they produce more plutonium than they consume fuel; in principle, such reactors make extremely efficient use of natural uranium. In practice, their construction and operation is sufficiently difficult that they are generally only used to produce plutonium. Breeder reactors are generally (but not always) fast reactors, since fast neutrons are somewhat more efficient at plutonium production. Plutonium-239 is more frequently used in nuclear weapons than uranium-235, as it is easier to obtain in a quantity of critical mass. Both Plutonium-239 and Uranium-235 are obtained from Natural uranium, which primarily consists of uranium-238 but contains traces of other isotopes of uranium such as Uranium-235. The process of enriching uranium, i.e. increasing the ratio of U-235 to U-238 to weapons grade, is generally a more lengthy and costly process than the production of plutonium 239 from U-238 and subsequent reprocessing. The "supergrade" fission fuel, which has less radioactivity, is used in the primary stage of US Navy nuclear weapons in place of the conventional plutonium used in the Air Force's versions. "Supergrade" is industry parlance for plutonium alloy bearing an exceptionally high fraction of Pu-239 (>95%), leaving a very low amount of Pu-240 which is a high spontaneous fission isotope (see above). Such plutonium is produced from fuel rods that have been irradiated a very short time as measured in MW-day/ton burnup. Such low irradiation times limit the amount of additional neutron capture and therefore buildup of alternate isotope products such as Pu-240 in the rod, and also by consequence is considerably more expensive to produce, needing far more rods irradiated and processed for a given amount of plutonium. Plutonium-240, in addition to being a neutron emitter after fission, is a gamma emitter in that process as well, and so is responsible for a large fraction of the radiation from stored nuclear weapons. Whether out on patrol or in port, submarine crew members routinely live and work in very close proximity to nuclear weapons stored in torpedo rooms and missile tubes, unlike Air Force missiles where exposures are relatively brief. The need to reduce radiation exposure justifies the additional costs of the premium supergrade alloy used on many naval nuclear weapons. Supergrade plutonium is used in W80 warheads. A small percentage of plutonium-239 can be deliberately added to fresh nuclear fuel. Such fuel is called MOX (mixed oxide) fuel, as it contains a mixture of uranium oxide (UO2) and plutonium oxide (PuO). The addition of plutonium-239 reduces the need to enrich the uranium in the fuel. Plutonium-239 emits alpha particles to become uranium-235. As an alpha emitter, plutonium-239 is not particularly dangerous as an external radiation source, but if it is ingested or breathed in as dust it is very dangerous and carcinogenic. It has been estimated that a pound (454 grams) of plutonium inhaled as plutonium oxide dust could give cancer to two million people. However, ingested plutonium is by far less dangerous as only a tiny fraction is absorbed in gastrointestinal tract. 800 mg would be unlikely to cause a major health risk as far as radiation is concerned. As a heavy metal, plutonium is also toxic. See also Plutonium#Precautions. Weapons grade plutonium (with greater than 90% Pu-239) is used to make nuclear weapons and has many advantages over other fissile material for that purpose. Lower proportions of Pu-239 would make a reliable weapon design difficult or impossible; this is due to the spontaneous fission (and thus neutron production) of the undesirable Pu-240. ^ "Physical, Nuclear, and Chemical Properties of Plutonium". Institute for Energy and Environmental Research. Retrieved 20 November 2015. ^ a b "Table of Physical and Chemical Constants, Sec 4.7.1: Nuclear Fission". Kaye & Laby Online. ^ Jeremy J. Whitlock. "The Evolution of CANDU Fuel Cycles and their Potential Contribution to World Peace". ^ Hala, Jiri; James D. Navratil (2003). Radioactivity, Ionizing Radiation, and Nuclear Energy. Brno: Konvoj. p. 102. ISBN 80-7302-053-X. ^ a b Bernard L. Cohen (1990). "Chapter 13, Plutonium and bombs". The Nuclear Energy Option. Plenum Press. ISBN 978-0306435676. Archived from the original on July 21, 2013. ^ Bernard L. Cohen (1990). "Chapter 11, HAZARDS OF HIGH-LEVEL RADIOACTIVE WASTE — THE GREAT MYTH". The Nuclear Energy Option. Plenum Press. ISBN 978-0306435676. Archived from the original on March 7, 2016. Emsley, John (2001). "Plutonium". Nature's Building Blocks: An A–Z Guide to the Elements. Oxford (UK): Oxford University Press. ISBN 0-19-850340-7.